The focus of this installation is a rare cadavre exquis (exquisite corpse) drawing, a remarkable new AGO acquisition made collaboratively by several major Surrealist artists. 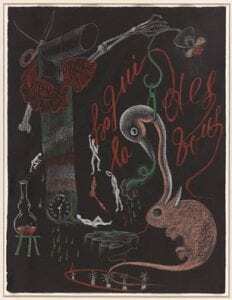 The creation of cadavre exquis drawings began in the 1920s as a parlour game. One artist made marks on a piece of paper, covered that section, and then passed the paper to the next person. As the paper travelled around the room, multiple artists made additions. The Surrealists were astounded by the powerful results of this activity, which reinforced their belief in “automatism,” the idea that works of art could be produced as expressions of the subconscious, the irrational and dreams. Many artists incorporated automatist approaches into their artistic practices.